Steven Noel Perkins' unauthorized trading pushed the price of oil up to $73.50 a barrel. 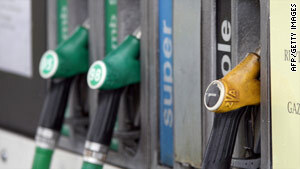 The FSA said the trading seems to have been a result of "extremely heavy drinking"
London, England (CNN) -- Britain's financial regulator said Wednesday it has banned an oil trader after he made huge trades while drunk last year, causing global prices of Brent crude to jump to abnormally high levels. Steven Noel Perkins, a former oil futures broker in the London office of PVM Oil Futures, was also fined £72,000 ($108,400) for market abuse, the Financial Services Authority (FSA) said. He is now banned from working in the financial services industry on the grounds that he is "not a fit and proper person," the FSA said. Perkins' job was to trade orders on an execution-only basis in Brent crude futures contracts on the ICE Futures Europe (ICE) exchange for his firm's clients, the FSA said. Early in the morning of Tuesday, June 30, 2009, Perkins traded on the ICE without any client authorization. He traded an extremely high volume and thus accumulated a long outright position on Brent. The price of Brent increased significantly as a direct result of his trades, the FSA said. His trading pushed the price up to $73.50 a barrel, the highest level it had hit so far that year, according to Reuters. "The FSA views market manipulation extremely seriously. The FSA said the trading seems to have been a result of "extremely heavy drinking" resulting from Perkins' alcoholism, which he now acknowledges. He had drunk "excessively" over the weekend of June 27-28 and throughout the following Monday before making the trades, the FSA said. "The FSA views market manipulation extremely seriously," said Alexander Justham, director of markets at the FSA. "Perkins' trading caused disruption to the market and has been met with both a fine and prohibition. This reinforces the fact that a severe sanction will apply in cases of market manipulation, even where no profit is made. "Perkins' drunkenness does not excuse his market abuse. Perkins has been banned because he is not a fit and proper person to be involved in regulated activities and his behavior posed a risk to the proper functioning of the market." In sanctioning Perkins, the FSA said it also took into account the fact that Perkins initially lied repeatedly to his employer to try to cover up his unauthorized trading. Perkins joined a rehabilitation program for alcoholics immediately after the incident and has now stopped drinking, the FSA said. "The FSA considers that it is possible that Perkins may be rehabilitated over time and may be fit and proper again in the future," it said in a statement. "The ban has therefore been limited to a minimum term of 5 years." The penalty for Perkins' behavior merits a fine of £150,000 ($225,900), but the FSA said it reduced that to £90,000 ($135,500) because the higher figure would cause him serious financial hardship. Because Perkins agreed to settle the case, the fine was reduced by a further 20 percent, the FSA said.